Metallics Activation - REEL Metallics should ALWAYS BE ACTIVATED WITH LIQUID COLOR rather than developer. Developer may be used but you will get a truer color using the liquid color. Want to make scars, bruises, blemishes, old age, scary monsters or change hair color? We have an array of palettes and kits to suit your needs. Spectrum colors, fleshtone colors, ghoulish colors, metallics and day-glo, even a palette designed by Academy Award winner Greg Cannom. All Palettes are activated with our REEL Developer, or 99% Isopropyl Alcohol. The REEL COLOR WHEEL PALETTE KIT is a paint box with all the REEL spectrum colors including aged tattoo linear and red neutralizer. You can make vertually any color either fleshtones or vivid spectrum colors. The COVER-UP/EFFECTS PALETTE KIT is the most versitile palette in the REEL Palette collection. You can create bruises, black eyes, cuts, etc. and also you can cover-up tattoos, bruises, scars, etc. with the fleshtone colors. REEL FLESHTONE PALETTE KIT (Dark) is created for the darker skin tones. To be used the same way as the regular FLESTONE PALETTE. REEL FLESHTONE PALETTE (Dark) is created for the darker skin tones. To be used the same way as the regular FLESTONE PALETTE. REEL FLESHTONE PALETTE DARK 2 is a NEW palette created with more otions on the darker skin tones. To be used the same way as the regular FLESTONE PALETTE DARK. 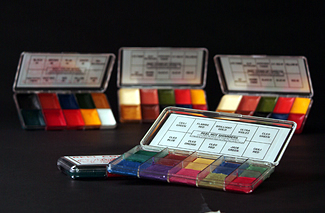 GREG CANNOM has developed make-up colors to represent the colors he uses and is famous for in his 'old age' make-ups. You remember the character 'Rose' in the movie 'Titanic'? Well, these colors are now a standard item made exclusively for REEL CREATIONS. REEL CREATIONS now offers this palette for you to create ghouls, monsters and other morbid effects. Included in the palette are new colors 'dead', 'blood' and 'vein'. All colors in this palette are also available in the REEL Body Art Inks. REEL CREATIONS now offers this new palette for you to create ghouls, monsters and other morbid effects. Included in the palette are new colors 'dead', 'blood' and 'vein'. All colors in this palette are also available in the REEL Body Art Inks. REEL CREATIONS now offers this NEW palette, expanding the color choices, for you to create ghouls, monsters and other morbid effects. All colors in this palette are also available in the REEL Body Art Inks. REEL CREATIONS now offers this NEW palette, adding more colors, for you to create ghouls, monsters and other morbid effects. All colors in this palette are also available in the REEL Body Art Inks. The REEL HAIR DARK PALETTE KIT is used to darken light or gray hair. You can also use this palette to darken a scalp in a pinch. The REEL HAIR DARK PALETTE is used to darken light or gray hair. You can also use this palette to darken a scalp in a pinch. The REEL HAIR SILVER PALETTE KIT is another way to go to lighten or streak dark hair. Some artists prefer the more opaque colors (REEL HAIR (Lite) PALETTE) while other artists prefer a more reflective color. The REEL HAIR SILVER PALETTE is another way to go to lighten or streak dark hair. Some artists prefer the more opaque colors (REEL HAIR (Lite) PALETTE) while other artists prefer a more reflective color. The REEL HAIR HIGHLITER METALLIC PALETTE KIT is used to streak hair, and/or to add metallic highlights which are many times required to eliminate the flat and/or dark look due to poor lighting conditions or film distortion. The REEL HAIR HIGHLITER METALLIC PALETTE is used to streak hair, and/or to add metallic highlights which are many times required to eliminate the flat and/or dark look due to poor lighting conditions or film distortion. BRAD LOOK has developed make-up colors to represent the colors for the Grime & Weathered look. These colors are now a standard item made exclusively for REEL CREATIONS. A NEW Pallete that is a variety of skin tones, including the ever popular Rice Pudding. It is used for mostly caucaisian skin, and can be mixed with our Fleshtone, or Dark Fleshtone palettes to attain the proper shade, for cover-up of scars, tattoos, bruises, etc. REPLACEMENT COLORS FOR OUR COLOR PALETTES!